One of the many reasons for the misinterpretation of Marx’s writings has its origins in the misunderstanding of his method. His mode of investigation was entirely dialectical. To many of his subsequent readers down the years this has made his work relatively inaccessible. At the beginning of the twentieth century the analytical school of philosophy had almost entirely eclipsed the dialectical tradition because of the analytical school’s association with the ‘scientific method’. The dialectics of the so-called continental philosophical school were thus confined to the analysis of the ‘humanities’ if they were used at all. When the analytical method was used to create the separate disciplines of economics, politics, history and sociology etc., (something entirely alien to the holistic dialectical approach) its conclusions were, unsurprisingly, very different from those of Marx. Sometimes this was due to the ideological bias of the individuals involved but more usually it was because the nature of the method defines the results. Some have thought that the analytical method easily disposes itself to defending the status quo and so is inadequate for use in radical and revolutionary discourse. It has been conjectured that the empirical analytical approach is optimal for the study of the natural sciences and that the dialectical method is superior in cultural analysis. Liberated from its present arcane and semi-mystical status dialectics can resolve this false duality and become a common-sense approach to understanding the world and our place in it. When many first attempt an understanding of the dialectical method they can be intimidated by what seems to be an investigation into an esoteric and alien intellectual tradition. But it can be a surprising revelation that this was, in part, how they had thought of the world long before reading a word of Marx or Hegel. The most obvious example of an ‘innate dialectic’ is the ease with which some can associate and locate their lives within the bigger political picture. The individual’s concerns, joys and sufferings can be understood alongside the identical emotions of fellow beings within, as is quickly discovered, not just a familial, local or even regional context but that of the human condition itself. The self is understood within an historical context that has inherited a social condition, a language and a set of values (together with the very concepts used to understand it all) from those who had gone before. Of course the dialectical philosophers had systematised these universal experiences into a coherent methodology which has accumulated, as all philosophical discourses do, a series of concepts and phrases that can seem very remote from everyday life. But at its heart it seeks to find a language that can simulate and thus render understandable the phenomena of the real world. Language is an abstraction of utterance and gesture. It seeks primarily to facilitate communication about the experience of existence. It is important to always remember that thought uses ideas (abstract representations of perception and experience) to create concepts (mental reconstructions of relationships between ideas) and as such they attempt to represent the objective world that we find ourselves within and are not those things in themselves. Language is so seductive that once it becomes inducted into thought itself it can be mistaken for that which it represents (idealism). We speak here of the Marxian version of the dialectical method which is used in the service of materialism rather than the idealism of Hegel (Marx famously subverted the Hegelian method) but the philosophical technique is fundamentally the same. The foremost discovery of any dialectical analysis is that any abstract (idea and concept) is in the process of change. This reflects the fact that all of the constituents of the world are becoming something other than they appear to be at any given time. Everything has to be understood in terms of what it once was, what it is now and what it will become. To study anything in isolation from this dynamic is misleading and ultimately futile. This continual change is due to not just external factors but also to the internal structure of the abstract concerned. This is what dialecticians call internal relations. The method seeks to comprehend four relationships between the elements within the idea (phenomena under consideration): identity and difference, the interpenetration of opposites, the transition from quantity to quality and the tension created by internal contradictions. These processes are universal and so reflect the whole within its parts but, as we shall see, the very distinction between ‘whole’ and ‘part’ quickly becomes philosophically redundant and is only retained as an expository expedient. Let’s use the humble apple as a subject for a dialectical analysis. The colour, shape, taste and texture combine to define ‘an apple’. These qualities are in turn dependent on a process that has changed the fruit and brought it to ripeness. In dialectical terms we see the development of the apple in both its difference from other fruits as well as its connection with them as part of the definition of being a fruit. We see in the ripening the interpenetration of opposites in terms of sourness transforming into sweetness. The development from a single cell to a combination of many as it grows is an example of quantity becoming a quality and finally the continuation of the processes of ripening, if the apple is left unpicked, will cause it to rot and die and this represents an internal contradiction. The perspective or vantage point from which the apple is perceived will also emphasise or diminish aspects of this development. The owner of an apple orchard will see the apples purely as having commercial value and will seek to maximise this by selective breeding and pest control etc. The consumer and/or producer of the apple will be purely interested in what it represents in terms of taste, price and wages. The tree’s fruit exists to pass on its genetic code as widely and as efficiently as nature will allow. These three perspectives may operate in parallel but each can obviously act against the interest of the others. In terms of what dialecticians call an extension of generality we know that the apple is dependent on the tree and that the tree is dependent on the sun and that much of life itself is dependent on solar energy etc. In this way a thorough understanding of an apple has the potential to give you an understanding of everything. Obviously the mind cannot embrace the universe as a whole so we are forced to abstract it into component parts to intellectually digest it at all; but this is always done with the aim of reconstructing the phenomena as representing the whole. With this in mind we are free to choose a point of view that we feel will be most revealing – rather than being restricted in our perspective by ideological conditioning. Marx was always aware that he had to explain his method and conclusions within a non-dialectical intellectual context. The dialectical method has come a long way since its origins of ‘thesis, antithesis and synthesis’ in the Ancient Greek discipline of rhetoric. It has been said that trying to comprehend the world without the aid of dialectics is like trying to board a moving train whilst blindfolded. 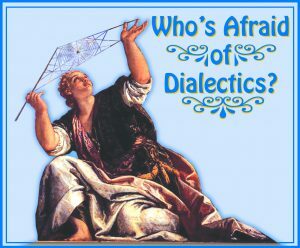 Dialectics is a method we can use to investigate the past, present and the future. Of all of the dialectical tools available Marx considered the investigation of ‘internal contradictions’ to be the most productive when studying history. Unlike most historians Marx analyses history backwards – he seeks out the elements in the past that are preconditions for the present. This is because, as already stated, every concept of the present is rooted in the past and possesses potential for the future. The money in your purse (present) has its origins in the development of an exchange economy (past) and as such is extremely unlikely to remain in your purse for long (future). The preconditions for the development of capitalism were both economic and political – Marx was never purely an economic determinist as he is so often portrayed. One of the necessary preconditions for capitalism was the economic power of the merchants, capitalist farmers and financiers whose wealth enabled them to replace the feudal lords as the ruling class which in turn accelerated the economic exploitation of coal and iron that instigated the subsequent industrial revolution. In other words the merchant adventurers, pirates and slavers who flourished under monarchical rule (Elizabeth I and James I) were the very people who would help to overthrow it; late feudalism had nurtured the elements of its own destruction (internal contradiction). Industrial technology facilitated social production which produced one of the famous instances of ‘the negation of the negation’ (when change seems to end up where it starts) because it severed the link between producer and owner (an earlier form of property) and substituted it with the ownership of the producer’s labour power as well as his product (property as capital) – one form of private property had replaced another. What, then, can be seen as the preconditions for the future within capitalism? If we look for the most obvious example of an internal contradiction within the contemporary world one stands out above all others, possibly the greatest in all of human history, and it is this individual (or state) ownership of the products of social production. That the majority are only allowed to produce for the profit of a tiny minority is as economically irrational in the twenty first century as was the political power and wealth of the aristocracy in seventeenth century England. The political recognition of this fact by the majority (the working class) necessitates its end. Just as social production had superseded the individual craftsmanship of the past so will social ownership (socialism) replace individual acquisition in the future. Dialectically we can then look back from this future to the present to seek out the preconditions for socialism within capitalism. We have achieved the necessary level of production and what we need is revolutionary socialist consciousness which, from the vantage point we have imagined from the future, necessitates the rejection of any reform or political compromise with capitalism. Of course we speak of the future in terms of the probabilities offered by the present but this is no crystal ball gazing because, as has been said, the use of the process of projection and regression is implicit in the conception of anything whether we are conscious of doing so or not. A pile of bricks is never just ‘a pile of bricks’; we interpret it either as the remnants of a building or as the potential for a new building; a baby is not just a baby but is hopefully the result of joy and a potential adult. Dialectics can help you understand the probable quality and value of either – a Taj Mahal or an Adolph Hitler. Given what has been outlined here it becomes obvious why dialectical materialism is feared and derided by those who would have us believe that capitalism represents the best of all possible worlds. The fear is instinctive (ideological) because few ever really attempt to understand it. As Marx said: the ruling ideas are those of the ruling class – a world where everything is frozen in time (we were just as violent and greedy in the past as we are now and the future will be no different) and where the only possible form of knowledge illustrates dead matter imprisoned in its present form and devoid of any inner dynamic that will change it (bourgeois economics and pseudo-science). Marx chose the vantage point of the working class because he understood that only they can create fundamental progress. History chooses a class to exhibit the potential for change; all it has to do is recognise the power that human development has given it. The theory of internal relations (dialectics) stands as the primary theory that can tell us when and how human agency can bring about a revolutionary political transition. Dialectics are fun.